WCRE is proud to have exclusively represented Compex Legal Services Inc. in the leasing of 1,684 square feet of office space at 1601 Walnut Street, Philadelphia, PA.
Compex Legal Services Inc is one of the largest litigation and discovery support services in the nation. A wide variety of services are provided, such as: Record Retrieval, Deposition Reporting, Multi-Plaintiff Litigation, Medical Record Summarization and Single Source Vendor Program. For over 30 years Compex Legal has grown immensely and now have offices in over 20 states throughout the country. 1601 Walnut is owned and operated by MedArts Properties, L.P. and is a well located office building situated in the Market Street West submarket. This premier office location is positioned in the Philadelphia CBD and provides for convenient access to I-76 and I-676. 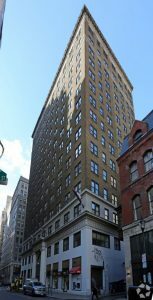 Joe Nassib, Associate at WCRE exclusively represented the Tenant in this transaction.